Shares equipment and space with others. To play, students sit in a line at one cone to begin. They pass the beanbag down the line, standing and then moving to the other end as soon as they’ve passed it. In this way, the group moves closer to the far cone. How quickly can the beanbag move from one cone to the other? Find this activity in the Fitness Knowledge Module at OPENPhysEd.org. 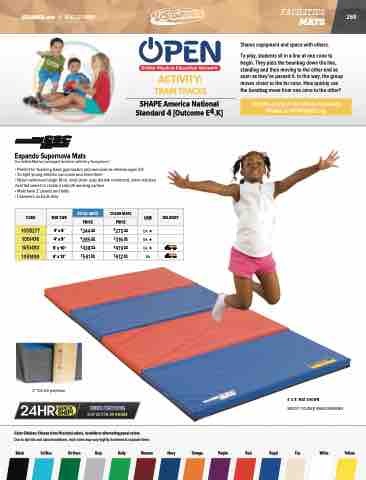 Our Softest Mat for Low Impact Activities with Very Young Users! Color Choices: Choose from 14 school colors, in solids or alternating panel colors. Due to dye lots and natural variations, vinyl colors may vary slightly if ordered at separate times.